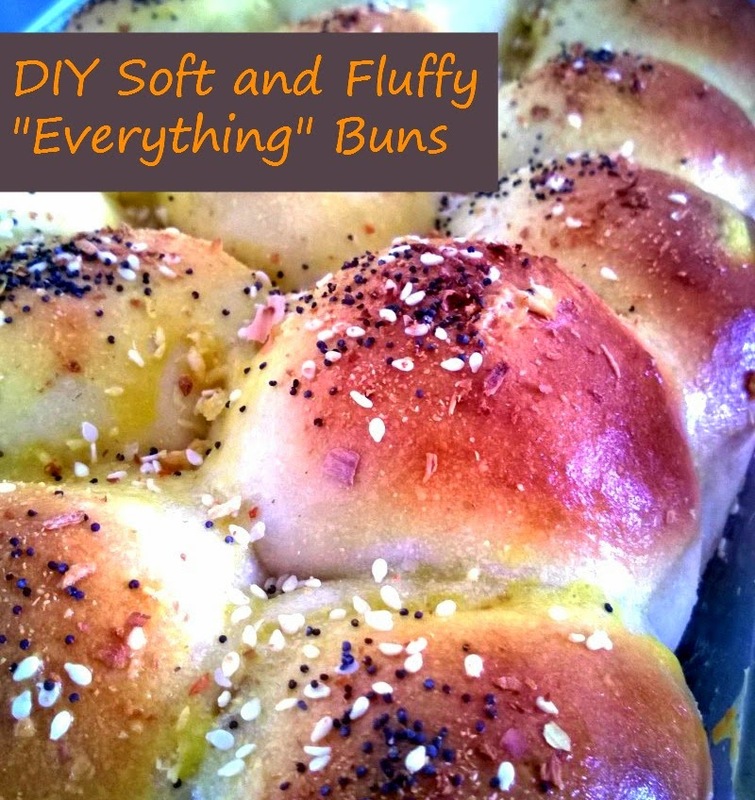 Soft and fluffy, these buns are great as a side with salad, to use as sandwich rolls, hamburger buns, or even just eaten buttered as a snack. I take advantage of my bread machine's dough cycle to make these buns, but they can just as easily be made with a mixer or by hand. When making any bread recipe, you may need to slightly adjust the amount of flour or milk added, depending on the humidity levels in your home. If the dough looks too dry, add a little drizzle of milk; conversely, if the dough is too sticky, sprinkle in a little more flour. The dough should form a smooth ball and be springy to the touch. As my husband says, "It's all in the dough ball!" 1. In your bread machine pan*, add the dough ingredients in the order recommended by your bread machine's manufacturer (generally liquids are added first and are then topped with the dry ingredients). 2. Start the machine's dough cycle. While the dough is mixing, generously grease a 9 x 13 inch casserole dish with butter and lightly flour a work surface. 3. Once the dough cycle is complete, remove the dough from the bread pan and place on the lightly floured work surface. Divide the dough into 12 pieces. Shape each piece into a ball (see a demonstration here). 4. Place the dough balls into the greased casserole dish. Cover with a towel and allow to rise until dough balls have doubled in size. Bake at 350 degrees F for 20 minutes. 5. Meanwhile, combine the egg yolk and 1 teaspoon of water in a small bowl, and grab a pastry brush. Have the rest of your "Everything" toppings ready to sprinkle on. 6. After the 20 minutes has elapsed, remove the buns from the oven and brush with the egg yolk mixture. Sprinkle on sesame seeds, poppy seeds, onion flakes, garlic powder, and salt to taste. Return the the oven and bake for an additional 5 minutes. 7. Remove casserole from oven and allow to cool for 5 minutes. 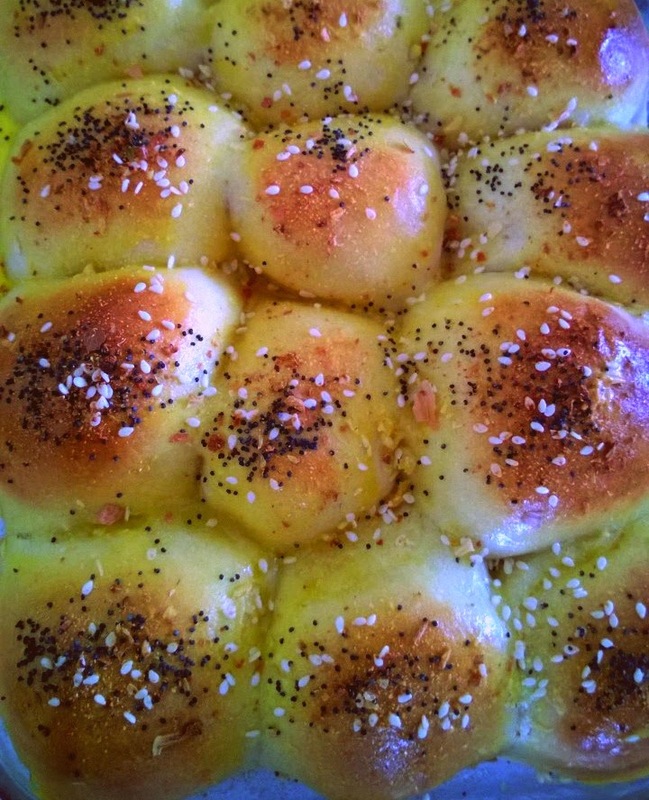 Pull buns apart and serve immediately. If you do not wish to serve the buns right away, pull them apart and place them on wire racks to cool completely before packing into an airtight container. Mix dough ingredients together in a large bowl, and then turn the dough out onto a floured surface. Knead by hand for 10 to 15 minutes, until the dough is smooth and elastic. Wipe the large bowl out and generously grease it with butter. Place the dough into the bowl, cover with a towel, and allow to rise until double in size. Proceed with step 3 above. Combine dough ingredients in mixer bowl with dough hooks attached. Mix on low until all ingredients are combined, and then increase speed to medium-low and mix for about 4 or 5 minutes, until the dough is smooth and elastic. Remove the dough from the bowl, wipe out the bowl, and grease liberally with butter. Return dough to bowl, cover with a towel, and allow to rise until double in size. Proceed with step 3 above.